For all the talk of a conservative resurgence prior to mid-term elections, there is mounting evidence that the movement is losing steam. The Virginian-Pilot reports that a major event for social conservatives, Freedom Fest 2010, was held on Sunday evening in Old Dominion University’ Ted Constant Convocation Center in Norfolk. Despite much-ballyhooed speaking appearances by right wing rock stars, Oliver North, former Sen. George “macacca” Allen and Sarah Palin, attendance was a great disappointment. The audience filled less than one-third of the arena, but many who showed up said they were looking for something to cheer. The news report does say that the crowd was “boisterous” and spent most of its time attacking Barack Obama. This is important, because all too often the media confuses rowdy Tea Bagger crowds with genuine popular support. But, if the religious right (with the star power of Palin and North) can’t even fill an arena in Old Dominion — then they are not as strong as they would have us believe. In fact, the evidence suggests a force in decline – albeit one that is still extremely strong and volatile. Early this morning, I went to the heavily promoted, “May Day 2010: A Cry To God For A Nation In Distress.” It was organized by Janet Porter (formerly Folger in red jacket) who is best known for running the failed “ex-gay” Truth in Love ad campaign in 1998. The event was a bust. Less than 300 (not official count, but my own estimate) people turned out in front of the Lincoln Memorial in Washington today to hear a star-studded line-up of evangelists and right wing political leaders. Organizers claimed from the stage that the event cost $70,000, so they had clearly expected an impressive turnout. Another conference, “The Awakening” at the late Jerry Falwell’s Liberty University in April also failed to attract a sizable audience, even though it was packed with notable anti-gay activists. Yeah, right. These were Democrats who were so disillusioned that Sarah Palin sounded like she was the answer. Are we supposed to believe this? 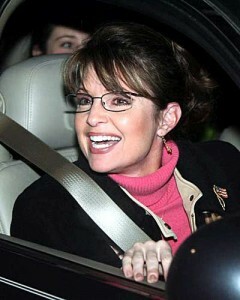 At the rally, Palin repeated her usual militaristic drivel. “We’re sick and tired of being jerked around ” by foreign dictators in order to get their oil, Allen said. “America has nothing to apologize for,” North said. Audience members paid between $33 and $133 for seats in the arena; a few ponied up $1,000 to $1,200 for VIP tickets that allowed them to pose for photos with Palin and North. Palin’ Norfolk appearance, her first since a 2008 Virginia Beach campaign swing, was one of three paid appearances in a few days. On Saturday, she spoke at The Oil Palace arena in Tyler, Texas, and is scheduled to appear Tuesday in the Gwinnett Center arena in suburban Atlanta. Despite the public’ willingness to compensate Palin and other political figures to hear their thoughts, Quentin Kidd, a political science professor at Christopher Newport University, said he’ not enthused about the practice. “In the old days, when a political cause or a campaign held a rally, the attendees could feel pretty confident that they were all motivated by the same cause,” he said. This garbage – coming from North, Allen and Palin – is what one of our major parties has been reduced to. Quite tragic…and dangerous. A nation that elevates such small minds simply can’t remain a successful and powerful country.